Living for just one year (though some can be protected over Winter e.g. Pelargoniums), these plants are suitable for baskets, pots, window boxes...or teapots, boots and colanders! A strict, old-school-style symmetrical pattern is not compulsory; experiment with bedding plants by mixing them with herbaceous perennials - grasses look fantastic with Cosmos. They can also be used as gap fillers, to replace early flowering herbaceous, or to cover the bare ankles of taller plants. 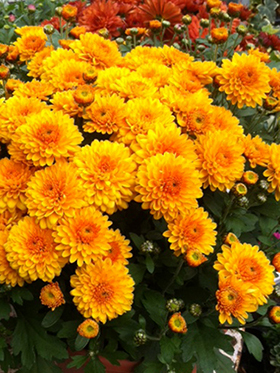 We buy our plants from two family-run nurseries in Cheshire; the quality really is exceptional. Big hits with our regulars are Scarlet and Hot Pink Bulls Eye Pelargoniums, 'Non-stop' Begonias in a range of eye catching colours, and Cosmos, which flowers from July until the first frosts. 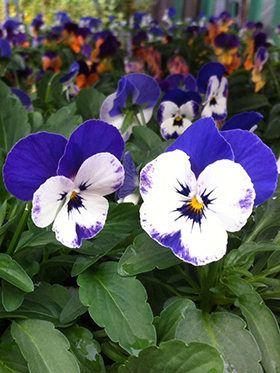 Firm favourites, Pansies and Violas, rub shoulders with the more delicate petunias, begonias and pelargoniums, all adding something to a seasonal display, whether it be height, scent, colour, contrast or WOW! We sell our own homemade hanging baskets from late Spring onwards, planted up in peat free compost. If you prefer to make your own, we also sell empty hanging baskets. Early September sees the arrival of our first batch of Spring flowering bulbs – plant them right up until November and, depending on the species, they will provide you with colour from January through to May.